Atop Scotts Bluff, the horizon is visible for miles. The land is a patchwork of fields—tall green stalks of corn and crops of dry beans and sugar beets separated by rural gravel roads. Closer to the bluff, the rural roads turn to asphalt and tidy arrangements of buildings replace fields. The large industrial holding tanks of the Great Western Sugar Company lie on the edge of the city near the fields, serving as a constant reminder of the interplay between the region’s agricultural roots and the subsequent urbanization of the Scottsbluff and Gering communities. The Scotts Bluff region has deep roots in commerce. The earliest evidence of white men in the region dates to 1811, when a group of intrepid fur trappers on the Astorian Expedition led by Robert Stuart travelled along the North Platte River returning east from Oregon. By the 1820s, the Rocky Mountain beaver fur trade was flourishing. Trapped nearly to extinction in areas farther east, beaver remained plentiful in the Rocky Mountain wilderness and areas west of Scotts Bluff. Trappers provisioned in St. Louis and other eastern markets for the long march to the Rockies, which often passed through the North Platte River Valley. One of these trappers was Hiram Scott, Scotts Bluff’s namesake. After a full season of hunting, trappers would return to St. Louis laden down with beaver pelts. Throughout the 19th century, emigrants utilized the trappers’ route to head west in search of land, gold, and religious freedom, and trading posts sprang up along the route. Journal accounts by travelers often mention an enterprising Frenchman, either Joseph or Antoine Robidoux, who established a blacksmith operation and trading post at Scotts Bluff as early as 1849. The American Fur Company operated another trading outfit southeast of Robidoux Pass at Fort John. Later in the 1850s, as the majority of emigrants began to utilize Mitchell Pass, the American Fur Company moved further north near Fort Mitchell to capitalize on westward bound traffic. These trading posts were the first long-term, nonmilitary, white settlements in the region. 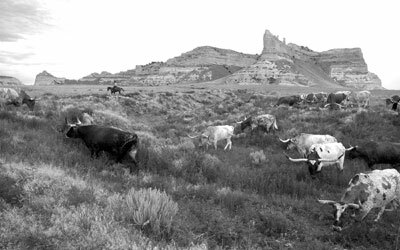 Although largely known today for crop cultivation, the earliest agricultural concerns in the Scotts Bluff region centered on cattle ranching. The first cattle ranches were road ranches, temporary resting areas set up by enterprising traders, who sold or exchanged cattle with emigrants heading west. Some reports mention that Robidoux’s outpost included a road ranch. By the 1870s, large-scale cattle ranching in the region had begun, and the number of road ranches declined. Following the Civil War, Texas cattlemen were flush with excess cattle, because they had been unable to sell their herds to the North during the war. To capitalize on the high prices offered for cattle in northern States, Texans began to herd their longhorns northward to the Great Plains, where railroads could ship the cattle back east. Herding eventually stretched into the open ranges of Nebraska. Nebraska’s vast open plains made for good grazing land. 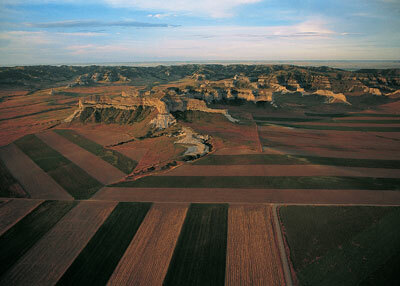 Within the Scotts Bluff area, most of the cattle were concentrated along the North Platte River Valley and Pumpkin Creek. By the 1880s, years of cattle speculation at trading centers in the East and two successive brutal winters in 1885-1886 and 1886-1887 led to hard times for many western Nebraska cattlemen. On top of this economic downturn, cattle ranchers in western Nebraska increasingly came into conflict with homesteaders. Farmers began moving into western Nebraska, first claiming homesteads along rivers and near creeks or streams, and the increased settlement in the area brought ranchers and farmers into competition for prime land locations. The tension between the two groups came to a head in the late 1880s, when homesteaders in Scottsbluff called for a special election with the explicit purpose of enacting a Herd Law to force cattlemen to pay for damages caused to farms by open-range cattle. The homesteaders carried the election, and following the enactment of the Herd Law, many of the largest cattle outfits in the area moved farther west into the still-open range of Wyoming. From the late 1880s onward, most of the cattle raised in western Nebraska did not come from large-scale cattle ranchers grazing their herds in the public domain. Instead, most of the cattle were raised by granger cattlemen—farmers who used a portion of their homestead to raise a small stock of cattle as secondary income. Though cattle ranching dominated the early agricultural period of the North Platte Valley, the region did not flourish until the successful introduction of crop cultivation in the 1890s. Despite the tens of thousands of westward-bound travelers, who experienced the vast open expanse of western Nebraska during the first half of the 19th century, most emigrants thought the land was unsuitable for long-term agriculture, and few people staked land claims. The low water supply deterred potential farmers. Rainfall was sporadic and unreliable in western Nebraska, and early settlers were fearful of farming there. One year of low rainfall could bankrupt a farmer—or even worse, lead to starvation. A nearly decade-long drought beginning in the late 1880s devastated the few farms in the region, further convincing farmers that access to a reliable water supply was crucial to successful farming in the Nebraska Panhandle. Increasingly, these farmers sought to implement irrigation systems in order to water their withering crops. In 1890, a group of farmers, many of whom had farmed in the irrigated fields of eastern Colorado, developed the Farmers Canal Company. The company’s goal was to construct an irrigation canal to provide a steady flow of water to over 80,000 acres of cropland. Despite the company’s lofty ambitions, large scale private irrigation projects were costly and difficult to implement. Although the Farmers Canal Company constructed more than 10 miles of canals and reclaimed many acres of land for cultivation, the high costs of canal construction doomed the company. Despite the company's financial failure, the project securely planted the idea with many homesteaders of improving the soil of western Nebraska through irrigation. Irrigation projects made the land more productive and valuable, but the capital needed to implement large-scale projects was considerable, as illustrated by the Farmer’s Canal financial failure. During the 1890s, however, many forward-thinking farmers engaged in small-scale, homesteader-implemented irrigation. Many of these projects involved tapping the resources of nearby creeks or streams to water one or two homesteads. In some cases, the irrigation works were significantly more advanced. Western Nebraska pioneer C.C. Hampton advocated the use of Aeromotor windmills to extract water for crops and livestock. Under Hampton’s irrigation practices, his modest 160-acre homestead ballooned into a 3,000-acre farm and ranch in less than a decade, thus proving that homesteading on the western Nebraska frontier could be successful despite limited water supplies. Though C.C. Hampton’s success was atypical, he embodied the spirit of numerous homesteaders in the area. By 1899, Scotts Bluff County led the State with more than 150,000 acres of irrigated land under cultivation, with much of the water supplied by small-scale, homesteader-implemented irrigation projects. By the 1920s, farmers had begun tapping into Nebraska’s rich aquifers using internal combustion pumps to draw water from shallow wells. Because of the prohibitive costs, large-scale irrigation did not begin in the region until the Federal Government’s passage of the Newlands Act of 1902, also known as the Reclamation Act. The law provided government funds to finance the North Platte Irrigation Project, which opened up nearly 150,000 additional acres of reclaimed arable land in Scotts Bluff and Morrill Counties for large-scale agricultural use. Because of the complex system of private and public canals that crisscrossed the region, the Scotts Bluff County Commissioners required canal companies to erect bridges, such as the Interstate Canal Bridge, where county roads intersected privately owned canals. Large and small-scale irrigation works opened up much of the western Nebraska frontier to farming, but many farmers lacked the education and experience required to manage irrigated crops grown in sandy soil. 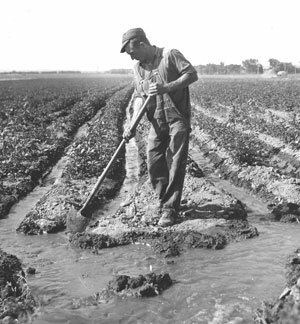 In the early part of the 20th century, several organizations, both public and private, attempted to teach farmers methods of irrigated crop cultivation. The Tri-State Land Company was an early private developer of irrigated farming. Tri-State encouraged and taught farmers how to grow crops on the company’s irrigated fields. The company also purchased the assets of the defunct Farmers Canal Company and restored and lengthened the Farmers Canal, opening up additional acreage to farming. Even the United States government was involved in teaching local farmers. The United States Department of Agriculture (USDA) established the Scotts Bluff Experiment Farm, a research facility designed to facilitate agricultural research and disseminate agricultural information. Scotts Bluff Experiment Farm, now part of the University of Nebraska’s Panhandle Research and Extension Center, is home to the Knorr-Holden Continuous Corn Plot, which has provided detailed scientific research data on irrigated corn cultivation in the region since 1912. By the early 20th century, emboldened by the government’s promise of 160 acres of land under the Homestead Act (1862) and accounts of farming successes in western Nebraska, more homesteaders began to settle in the North Platte River Valley. Though only allowed 160 acres of land under the terms of the Homestead Act, many settlers increased their holdings either through preemption—buying an additional 160 acres of land outright at the government’s minimum price of $1.25 per acre—or, perhaps, if funds were short, obtaining additional acres through the Timber Culture Act of 1873. Under the Timber Act, homesteaders could gain an additional parcel of 160 acres, if they agreed to plant trees on at least 40 acres. These additional avenues for land acquisition allowed many homesteads in western Nebraska to grow well beyond the government’s decree of 160-acre homesteads. In 1904, Nebraska Congressman Moses Kinkaid further bolstered homesteading by sponsoring the Kinkaid Act. This law increased the amount of land available to homesteaders from 160 acres to 640 acres. Despite the increased size of homesteads, successful irrigation projects, both stream and subterranean pump-based, ensured a stable supply of water for crop use. Because of these developments, homesteading in the North Platte Valley reached fever pitch by the early 20th century. Thanks largely to scientific breakthroughs in agriculture and the ease of obtaining vast tracts of land, the western Nebraska plains, once thought by many overland trail emigrants to be an infertile desert, became one of the nation’s premier agricultural regions. The dominant commercial crop in the region was initially sugar beets. Headquartered at Scotts Bluff, the Tri-State Land Company first introduced the sugar beet on a large-scale to western Nebraska by growing it on their irrigated, privately owned farms as early as 1901. Less than a decade later in 1910, the first beet processing company in the area, Scottsbluff Sugar Company, formed. Later that year, the Colorado-based Great Western Sugar Company took over the company. 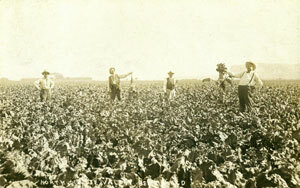 Introduction of the beet crop revolutionized the North Platte River Valley. Beets provided revenue from direct crop sales, and the tops of beets cut off during processing fed Nebraska cattle. The feed production boosted cattle growth and fueled the region’s meat packing industry. Manure that the cattle produced became fertilizer for crops such as grain, beans, potatoes, and alfalfa. Beet cultivation stabilized agriculture in western Nebraska, which in turn helped increase the number of permanent citizens. It is no coincidence that the greatest period of population growth in Scotts Bluff directly followed the introduction of the beet. Census records indicate that between 1910 and 1920—the years that marked the beginning of major beet cultivation and processing in the region—the population of Scottsbluff increased 263 percent, from 1,746 to 6,912. One of the ancillary effects of beet cultivation was an increase in ethnic diversity. Beginning with the establishment of the Great Western Sugar Company processing facility in Scottsbluff in 1910, immigrant labor became a mainstay of the Scotts Bluff area economy. Up until the 1920s, German, Russian, and Japanese migrant laborers performed most of the beet cultivation. By 1925, however, demographics shifted with Hispanic workers performing most of the labor. Today, many local townspeople descend from these original immigrant workers and contribute to Scottsbluff’s cultural diversity. The earliest businesses in the days of the Oregon Trail revolved around trading with emigrants bound for the West, but irrigated farming and the introduction of direct rail lines into Scottsbluff in 1900 led to an economic boon for citizens of the region. Direct rail lines ensured that area farmers could ship their perishable goods to distant markets without fear of spoilage. The towns of Scottsbluff and Gering quickly rose to prominence as the urban center of western Nebraska. By 1920, businesses such as the Gering Brick Company, which Danish immigrant Severin Sorenson owned and operated, and the Carr & Neff Lumber Company provided raw materials to build Scottsbluff and Gering into thriving towns. 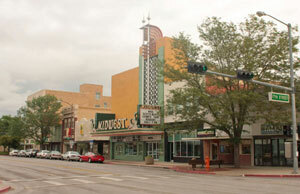 The Scottsbluff business district largely consisted of low-rise commercial and industrial buildings. At the south end of the district stood the cityscape’s major focal point, the six-story Lincoln Hotel. By 1940, Scotts Bluff County was the third most populous county in Nebraska, and Scottsbluff was the sixth most populous city. During this boom period, the city saw the construction of many distinctive buildings—among them the Fontenelle Apartment House, the Marquis Opera House, and the Western Public Service Building. Although Scottsbluff and Gering have blossomed into the major urban center of western Nebraska, the region’s prominence still rests on agriculture. In more recent times, corn, dry beans, and alfalfa joined the historically important sugar beets as the dominant irrigated crops. Crop processing plants provide numerous jobs within the region. With a labor market of more than 57,000 workers, the Scottsbluff/Gering micropolitan area is the site of western Nebraska’s greatest concentration of agricultural production facilities, manufacturing firms, and retail stores. While farming still maintains a dominant position in local life, citizens in the region are in an advantageous position—able to partake of city life, while remaining true to their agricultural roots.